It’s an exciting time to be a connoisseur of rum and rum cocktails. There’s no doubt that cane spirits are growing in popularity and respect, best evidenced in South Florida by the rise of the Miami Rum Renaissance Festival. The event expands every year, showcasing a never-ending supply of new and classic rums. Now in its sixth year, the event is expected to attract at least 80 rum producers showcasing more than 200 rums from more than 30 countries. Expanded to include more than 50,000 square feet of exhibition space, it’s possible the event could attract upwards of 15,000 attendees. 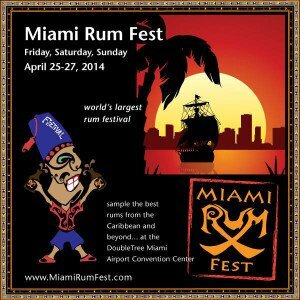 It’s considered to be the world’s largest rum festival. When you think of the Miami Rum Renaissance Festival, you immediately think of the giant convention floor filled with booths offering up samples of hundreds of rums, served both neat and in delicious cocktails. Taste your way around the world of rums, from Abuelo (Panama) to Zaya (Trinidad and Tobago), learning about their history and production from industry representatives. Its an intoxicating atmosphere – the scent of rum, mint and lime wafting through the room as the thousands of guests mix and mingle. It’s a great place for both newbies and experienced rummies to discover new flavors and revisit old favorites. Friday is the Trade-Only Preview, reserved for members of the spirits industry. The tasting runs from 3 to 7 p.m. and costs just $20 for qualified members of the spirits trade. This includes food and beverage managers, liquor store buyers, brand representatives, bartenders, sales associates, distributors, importers, and other trade professionals. The Friday and Saturday Grand Tastings are open to the general public from 3 p.m. to 7 p.m., with tickets $50 per day. VIP access (beginning at noon) is available for $75 per day. Go for the gusto with a three-day VIP ticket for all three days for $150. A great facet of the event that many attendees pass up is the wide selection of educational symposiums presented by experts from around the world. Held on Saturday and Sunday during the Grand Tasting event, these seminars are a nice getaway from the busy main floor and also the perfect opportunity to improve your knowledge of rum, cocktails and more. 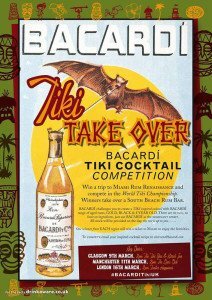 * The Wonderful New World of Tiki Cocktails, by global rum ambassador Ian Burrell. * The Discerning Qualities of Fine Spirits, by international spirits judge Bernhard Schafer. * Cocktails in Literature, by Phil Greene of the Museum of the American Cocktail. * Making Falernum, by mad molecular scientist Tyler Kok. * Lost Spirits: Navy Style Rum, by master distiller and blender Bryan Davis. * Rhum St. Barth, by London bar owner Paul McFadyen. Burrell’s seminars are always among the best, and his take on the Tiki cocktail movement should be enlightening. I enjoyed his comprehensive look at the Piña Colada at the 2012 festival [see recap, photos]. The globe-trotting rum ambassador promises to give us his top 10 reasons why the Tiki phenomenon is here to stay. Check the seminar schedule for full details. Considering that the Miami Rum Renaissance Festival is the world’s largest gathering of rum experts, professionals and enthusiasts, it’s the perfect setting for those groups to meet face-to-face. During the week, the experts judge rums in a prestigious blind tasting competition, with winners announced and prizes awarded at Trade Day on Friday. These experts – including rum festival organizers, industry luminaries, and reviewers – can typically be found at seminars, special events and socializing at the Grand Tasting. There’s no better environment to chat up these fonts of knowledge about rum and the state of the spirits industry. Don’t be shy, they’re glad to meet and get feedback from real consumers. Returning after a one-year absence, this over-the-top bartending competition pits the United States against the United Kingdom with a competition sponsored by Bacardi. 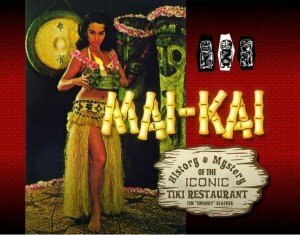 The top Tiki cocktail bartenders from each country will compete before a panel of local and international experts. Kudos to the Rum Fest organizers – Robert A. Burr and Robin Burr, plus son Robert V. Burr – for bringing back this mixology contest. If past competitions are any indication, it will be a grueling test based on criteria such as showmanship, presentation, execution, taste and creativity. The competition will be held throughout the week and the results announced on Sunday. More details on the competition will be announced soon. I’m eager to see who represents the U.S. in an effort to wrest the title away from the U.K., who prevailed in the last competition in 2012. Included with admission to the Grand Tastings on Saturday and Sunday is a marketplace that features a growing list of vendors selling their wares – from fashion and arts/crafts to books, Tiki collectibles and home decor. It’s fun to take a break from the festivities and browse all the cool booths, usually away from the hubbub of the main convention floor. Participants who have signed up so far are: 786-Bartend, Aroma Ridge, Barritt’s Ginger Beer, Black River Chocolate, Books & Books, Carib Graphics & Packaging / Caribbean Label Crafts, Chilled Magazine, Coconut King, Don Zavier, Fashion Tramp, Fee Brothers, Go11Media, HP Global Brands, Neat Glass, Newport Marketing, Nigel Sade, Nik Satterfield, Tahiti Joe’s Hot Sauces, Tapi Corks, and Tortuga Tile Works. 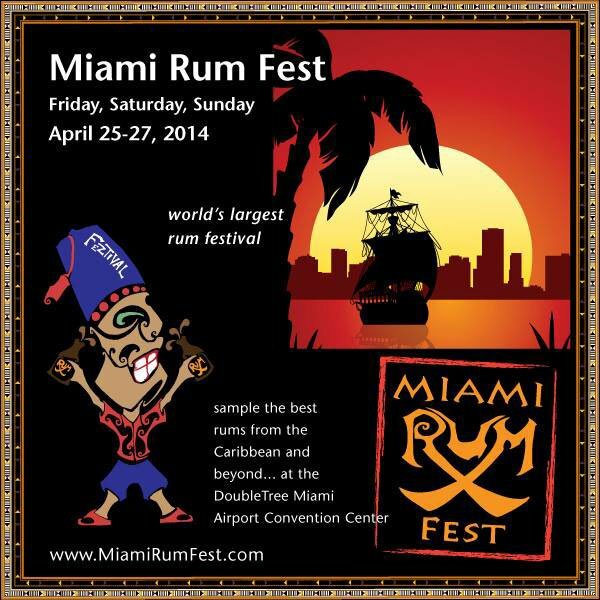 Check the official Rum Fest site for full descriptions and links to the vendors’ websites. A sneak preview of what’s coming in 2015, this new event shows unlimited potential. Scheduled for the week prior to the Grand Tastings (starting Monday, April 21, and running through the weekend), this sneak peek of Miami Cocktail Week is designed to offer consumers and members of the trade high quality cocktails and build appreciation for the best bars, bartenders and spirits. For the general public, the plan calls for special cocktails featuring participating rums to be served at venues throughout Miami. Industry reps and VIPs can attend special events hosted by spirit brands at select cocktail venues. Details are still being worked out, so check the official sites for updates. This event is a welcome addition, bringing the local craft cocktail scene into the festivities while also providing more opportunities for guests to sample great cocktails. This entry was posted in Cocktails, Events, Rum, Rum festivals, South Florida and tagged Ian Burrell, Miami Rum Renaissance Festival, Robert Burr, Robert Burr's Rum Guide, Robin Burr, rum. Bookmark the permalink.